As much as I keep a close eye on my sugar intake (even unrefined sugars), I love to start my day with something sweet. Usually my first step out of bed is straight towards my colourful, seasonal fruit bowl! I am a huge ambassador for breakfast. If you can’t handle a meal straight out of bed at least go for your piece of seasonal organic fruit. Look after that metabolism! Chia pudding is such an easy go-to for me. You can actually mix these guys up, go and get dressed for the day and it will be ready by the time you are. 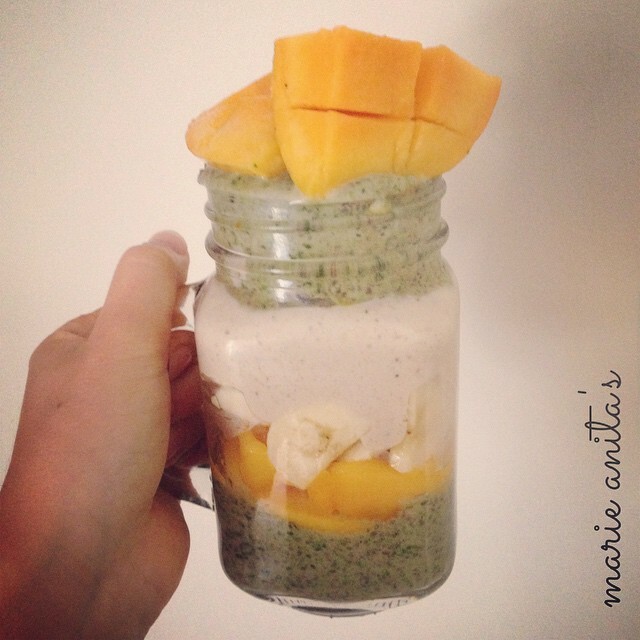 Hint >> if you mix it in a processor the chia will break up allowing it to swell more quickly! Always take into consideration the consistency of your ‘liquid’. I love pureed fruit and nut milk combos to add some sweetness so if your fruit puree is thick you may need to go for more like 1 1/4 to 1 1/3 cups liquid. Today’s chia trifle was put together as I was needing an extra kick today so this baby is loaded with healthy medium-chain fatty acids from our beautiful friend, the coconut. Medium-chain fatty acids are used differently being sent to the liver to be immediately converted into energy. On another note, please respect our farmers and use local and organic produce whenever you can <3 Today’s bananas are from a spray-free roadside stall in northern NSW and, the best spinach from my friend and supplier at Miami Organic Farmers Markets, Sylva. Mangoes are still in abundance but very close to the end of the season and I am very anxious about what will happen to me when I cant buy trays anymore!! My current mango tray is a certified organic spotty/second mangos from QLD purchased at $8.00/tray. In season organics really can be sourced at good prices!